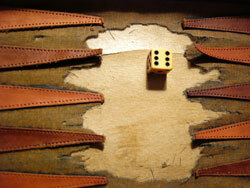 Backgammon has very ancient origins and its evolution has occurred over an incredibly long period of time. It's most ancient ancestor is a game called "Senet" which was developed in ancient Egypt and played on a board with 3 X 10 squares. No one knows details of the rules for sure, some have hypothesized that it was gambling game of movement and displacement of opposing pieces moving in opposite directions. The movement was thought to be controlled by the roll of dice made of bones or ceramic. In archeological discoveries dice have frequently been found with these distinctive "Senet" playing boards. The game arrived in England as a result of invasion during the 1st century AD. The game came to be called "Tables" and the rules became more recognizable to those of our modern variety. It survived the middle ages as a gambling game of the upper classes and then was banned for a time in England because of its gambling nature. The game was first referred to as "Backgammon" in 1645 and it is thought that the name derived from the Middle English word "gam" meaning "game" and "back". Together it probably meant, "the game where you can go back" referring to a blot that has been sent back to the bar. The first official rules of backgammon was written in 1743 by Edmund Hoyle. In 1920 the doubling cube was introduced in New York and the stakes of the gambling game has been accelerated by this concept much more quickly. Generally, it also had the effect of favoring skilled players more capable of judging the chances of certain positions. Backgammon has not changed since then, however, its study by assiduous players and its popularity has waxed and waned. The face of backgammon has substantially been changed by computers and it has recently become a fixture of the online gambling environment. Today backgammon is a global game, there are backgammon tournaments held in the United States and Europe and annual world championships.